Wall Mounted Shower Seat With Adjustable Legs. 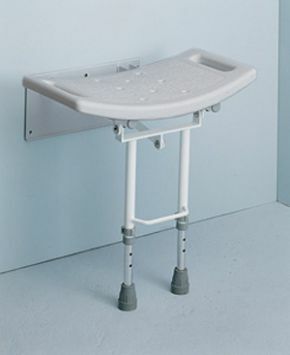 These wall mounted shower seats have fold down, height adjustable legs to provide stability where the wall construction does not allow an unsupported seat. The legs are finished with non-marking, slip-resistant rubber tips for additional safety. Constructed from easy-to-clean, blow-moulded plastic the seat has built in handles to give extra security to the user. Available with a choice of aluminium or steel frame, both of which fold against the wall when not in use.